Salmon fillets are easy to work with. If you’re in a hurry or nervous about handling sea creatures, this fish is for you. Pretty in pink, its sturdy in both texture and flavor. Use my recipe and you’ll have a tasty main course that’s easy to make. Try this salmon with a scoop of rice or quinoa, or a bowl of noodles. Sliver it and toss some flavorful chunks into a green salad or pasta dish. 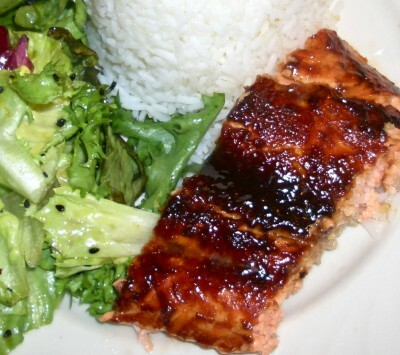 Besides the fish, all you need is a sweet, thick, dark brown hoisin sauce. To be honest, there’s not a single healthy thing about hoisin. This brown goo is mostly sugar lolling around in fermented bean paste — and it’s a Chinese kitchen staple. 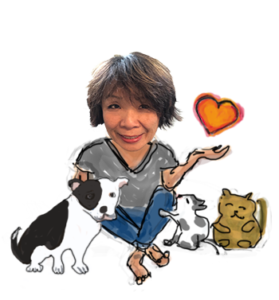 I grew up with the Lee Kum Kee brand. A 14-ounce jar sells for $1.89 at my local Asian market. You can also get it online. And, many major supermarkets carry hoisin sauce in their ethnic food sections. 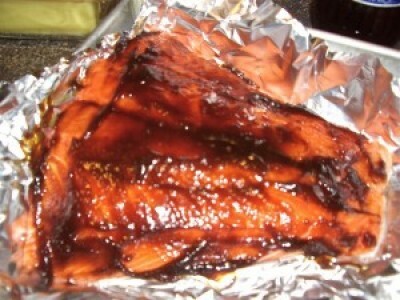 If you can’t find it, try substituting teriyaki sauce or any sauce that’s got body and enough sugar in it to carmelize during the the broiling process. As long as it’s not runny, it should work fine. Place raw salmon fillet on baking pan. Smear with hoisin sauce. 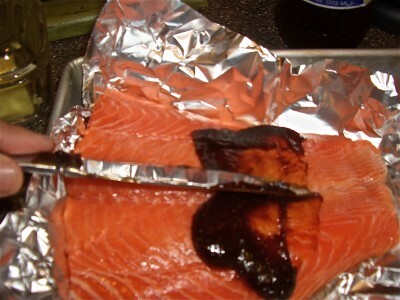 Preheat broiler then broil salmon until sauce chars to a burnt black. Stick knife in thickest part of the fillet to check for done-ness. Slice fillet into serving portions. You’re done! If you can’t broil, baking your salmon at a high temperature works too. So does pan frying your salmon in a saucepan — let it cook until crusty on the bottom, then flip it over and cook some more, until the sauce side gets crusty too. Grilling is yet another option (although it can really stink up your grill). No matter what method you use, keep checking your salmon every five minutes or so. You want it done but not dry. Once, I forgot to check my salmon and it seemed to be burned to a black crisp. But when I sliced, it, the fish was moist and delicious. ooooh. I know what I’m having for dinner tonight! never thought of using Hoisin sauce! I’m going to try, thank you for the recipe! Kinda of a different way to cook Salmon. I guess I will have to try it (if I am not too Lazy). With the sauce there is a chance to burn it so I will have to watch it! That will be different. Usually I wrap the Salmon in foil with butter, lemon slices, pepper and some spices. 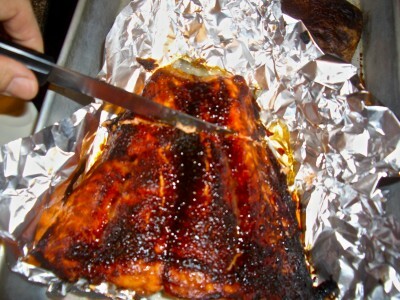 Then just let it cook in it’s own juices for 25 min to a half an hour on the barbeque. Or double wrap it, build a fire in the sand, let the fire die out and bury it in the sand. We cooked some Red Snapper like this on a family vacation that was the best I ever tasted (either by ourselves or at any restaurant ) The trouble is no remembers how we did it! I guess that is the joy of cooking, trying new things.